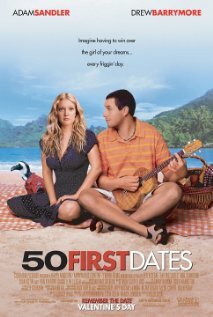 50 First Dates is one of those movies I wanted to hate, but for whatever reason, I couldn’t. I’m not much of and Adam Sandler fan. I really don’t care for Rob Schnieder. The humor is juvenile and silly, but what girl wouldn’t be totally impressed by a guy who works to make her fall in love with him every day? So we start off getting to see Sandler’s character, Henry Roth, as the ultimate player. He only dates tourists and Hawaii is obviously full of them. But ultimately, Henry wants to sail up to Alaska to study walruses. On one of his test drives with his work-in-progress boat, he gets stuck and finds himself waiting for help in a little cafe where he meets Drew Barrymore, who plays Lucy. Their first meeting seems magical and they spend quite a while talking, all seems to be going well. They part ways but Henry can’t get Lucy out of his mind. So, Henry goes back to the cafe and tries to talk to Lucy – who has a MUCH different reaction than she did before. The cafe owner tells Henry about Lucy’s condition in that she cannot retain any new memories. Each night when she sleeps, it erases the day. While this is the PERFECT out for Henry, he just can’t stay away. So, he goes to the cafe each day and tries various things to get Lucy to talk to him again. Lucy’s father & brother recreate the day of Lucy’s accident down to the last detail… the football game that was on TV that day, the birthday present they re-wrap each night so it can be given again, a whole stack of newspapers from the day – they cover every base they can. However, through a series of events, their game plan gets changed and they (with Henry) try a new strategy. As much as Lucy can’t retain memories, certain patterns start to form and even her Dad can see the good Henry has done for her. But, Lucy fears her condition is keeping Henry from doing what he really wants and so she erases him from her life. 1. Conversion is possible. Henry was a player, but his feelings for Lucy made him better. And, shock of all shocks, SHE DIDN’T TRY TO CHANGE HIM!! Henry came to realize on his own how important his connection to Lucy was and all those hot toursistas just didn’t have the same appeal. But that change needs to come from within. If Lucy had tried to change Henry, we wouldn’t have seen his conversion. He might have done what she wanted in hopes of sexual rewards, but it would not have been a true conversion, and when she let him go, he would have happily moved back to what he was doing before meeting her. 2. What we do does affect others, even if we don’t see it, and many times even if they don’t acknowledge it. So, Lucy’s dad points out to Henry that she only sings on the days that she runs into Henry. Then later we see that she’s been artistically re-creating images of him, even though she claims she doesn’t know who he is. Even though she doesn’t remember him consciously, she does remember him subconsciously. How often have you walked away from an exchange with someone and kicked yourself for what you didn’t say, or read more into it than you’d previously thought was there? Everyone has those sort of experiences. Most everything affects us more than we realize – so be careful. 3. Laugh at yourself. Just about every character has certain traits that you can’t help but laugh at. There’s even a few jokes about Lucy’s “broken head.” We can’t take ourselves too seriously. Much of the humor is quite crude and I find it sad that the filmmakers seemed to need so much of it with such a great story. If you decide to show this flick, you might want not want it to be a co-ed audience to prevent any awkwardness. However, most everyone has heard this type humor at school, work or somewhere, so I’ll let you judge what your comfortable with.